1 cup of cranberry contains 50 calories and 5 g of dietary fiber. It is also a good source of vitamin C and minerals. A Rutgers University study found that cranberries increased the effectiveness of medications used to treat cancer of the ovary. 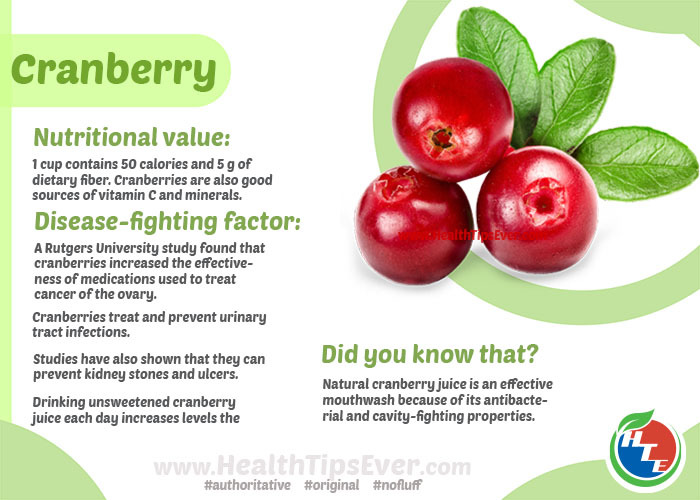 Cranberries treat and prevent urinary tract infections. Studies have also shown that they can prevent kidney stones and ulcers. Drinking unsweetened cranberry juice each day increases levels the “good” HDL cholesterol. Natural cranberry juice is an effective mouthwash because of its antibacterial and cavity-fighting properties.